What a beautiful day to be outdoors. When I left the river the air temp was approaching 50F with a mix of sun and clouds and a nice breeze. Just a little over 3 lbs. 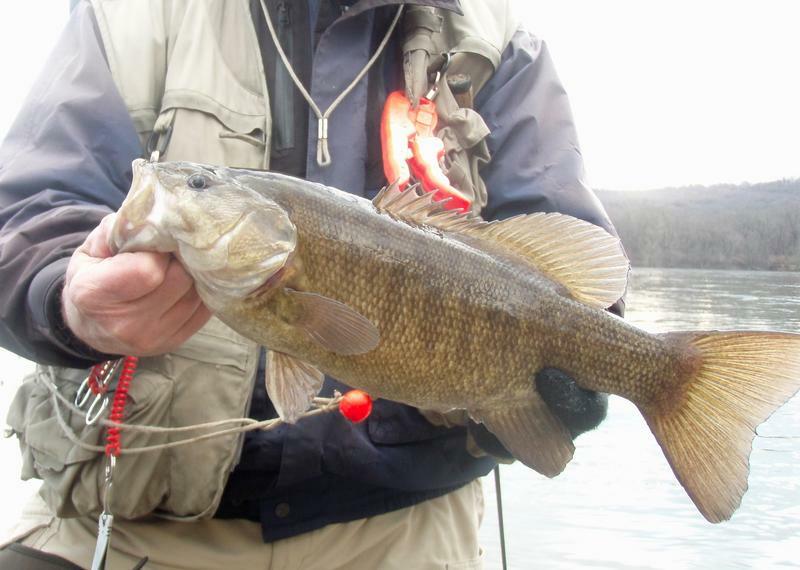 "Hope springs eternal in the smallmouth fisherman's heart"
Hey Bill - do you ever find them schooled up during the winter or is it one fish per eddy? When the power plant above where I fish was putting out warm water in winter it was not unusual to catch schooled bass anywhere along the shoreline. You could also find swarms of baitfish and some active crayfish along the shoreline. Doesn't happen anymore. Since the warm water stopped...so did the schooled smallies. Occassionally I will still find 3 or more bass occupying an eddy but lately only a single or a double can be expected. I attribute it to the loss of the power plant but we have had a lot of smallmouth disease in this area of the Susquehanna and there are far fewer smallmouth here. In water under 40F ...I may make 20 or 30 casts into a good eddy before I convince the fish he wants it. Cold water requires patience and perseverance. I cover a good bit of ground in 2 hours and make a lot of casts as things are now. That’s what I needed to hear and learn from! I’m making fewer than 10 casts thinking there have got to be fish here, why can’t I catch them? Sounds like success begats success. You need to have caught fish in an area before to have the patience to make 30 casts to a spot. I am curious though - how do you cover a lot of ground when making that many casts to one spot? Your right your prime areas cover a distance of 214 yards. Now that's what I call laying down some knowledge! There you go Zelmo...an exact measurement from Responsible Angler...I can cover over 2 football fields methodically in 2-3 hours. It's nice to know that I am followed so closely.